Single-tenant building option for Vornado Realty Trust’s 15 Penn Plaza site. Image: Courtesy of Pelli Clarke Pelli Architects. Multi-tenant building option for Vornado Realty Trust’s 15 Penn Plaza site. Image: Courtesy of Pelli Clarke Pelli Architects. Proposal includes options for single- and multi-tenant building on site currently occupied by the Hotel Pennsylvania. On February 8, 2010, the City Planning Commission certified Vornado Realty Trust’s application to build a 2.05 million sq.ft. office tower at 15 Penn Plaza in Manhattan. The site is across the street from Madison Square Garden and Penn Station, and is currently occupied by the Vornado- controlled 1,700-room Hotel Pennsylvania. Vornado would demolish the hotel to build the tower, and it intends to construct an as-of-right building if it does not obtain approval for the proposed project. In order to increase development flexibility and ensure that it can begin construction as soon as possible, Vornado’s application included two different building plans. It originally proposed two building scenarios that would have provided 2.84 and 2.65 million sq.ft. of floor area respectively. 6 CityLand 7 (Feb. 15, 2009). The reduced certified proposal, however, showed two buildings that would each total 2.05 million sq.ft. of floor area. 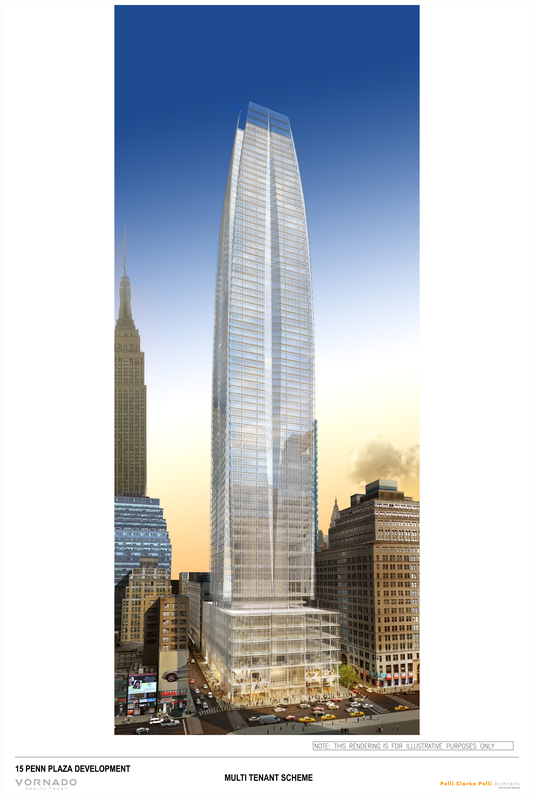 According to Vornado, the designs cannot be blended, and it intends to build one or the other of the proposed options. A single-tenant, 67-story building option would feature a ten-story, 218-foot tall base with a tapered tower rising to 1,190 feet and no setback along the Seventh Avenue frontage. The tower proposal would provide 2.04 million sq.ft. of office space and 12,000 sq.ft. of retail space on the ground floor. A proposed multi-tenant, 68- story tower option would feature a six-story, 134-foot tall base. 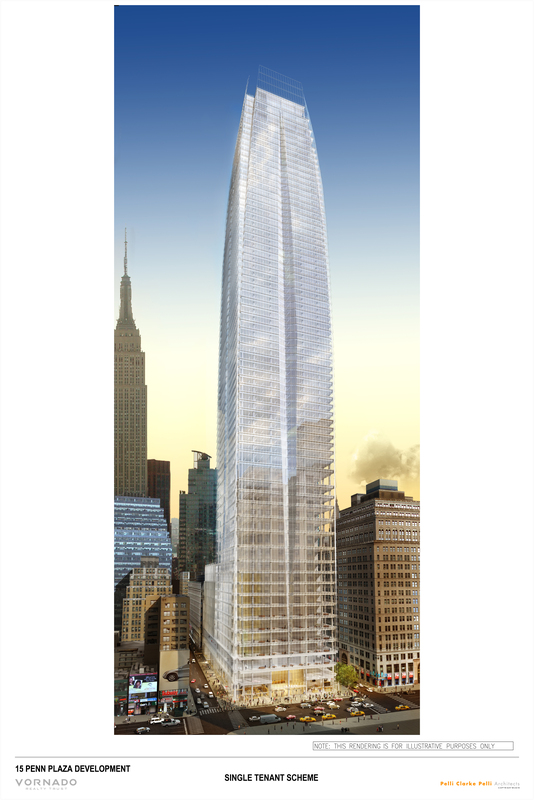 The building’s tapered tower would be set back 83 feet along Seventh Avenue and rise to a height of 1,216 feet. The multi-tenant building option would include 1.76 million sq.ft. of office space and 300,000 sq.ft. of retail space, including up to 27,000 sq.ft. on the ground floor. To attract financial institutions as potential tenants, both building options would include space suitable for use as a trading floor. The proposal includes transit improvements on and around the project site. Vornado would renovate and reopen the Gimbels Passageway underneath the south side of West 33rd Street that connects Penn Station and the Seventh Avenue subways lines to the Herald Square subway lines and PATH trains. The passageway would provide access to below-grade retail. Vornado would also relocate and upgrade subway entrances at Seventh Avenue and West 32nd Street, and Seventh Avenue and West 33rd Street. Vornado submitted multiple applications, including a request to rezone the site’s mid-block portion from C6-4.5 to C6-6 to match the Seventh Avenue frontage’s C6-6 zoning, and for special permits to modify height and setback regulations and to receive a twenty percent floor area bonus for the proposed mass transit improvements. In addition, Vornado requested zoning text amendments to modify the Special Midtown District regulations and to allow any of the transit improvement bonus not used on the proposed office tower to be available for use elsewhere on the zoning lot. Manhattan Community Board 5 has until April 19 to review the plan. CPC: Certification of 15 Penn Plaza (C 100047 ZMM – rezoning); (N 100048 ZRM – text amend. ); (C 100049 ZSM – spec. perm. ); (C 100050 ZSM – spec. perm. ); (C 100237 PQM – City acq. of easements) (Feb. 8, 2010) (Architects: Pelli Clarke Pelli Architects).